Article Review: Ankle muscle activation when using the BOSU Balance Trainer. So, recently a student I am working with asked me a question regarding the BOSU ball. She asked which side was harder to balance on. I asked her what she meant by “harder”. Harder for the whole body, harder for balance, etc, and I remembered recently reading this article, which shed some light into her question. Purpose: To determine which side of the BOSU would generate a greater amount of tibialis anterior, peroneus longus, or medial gastroc muscle activity using EMG. Subjects: 20 recreationally active men with an average age of 21.4 years +/- 1.4 years, excluding people who have had a lower extremity injury within the past two years. This study also excludes people who have balance trained before, and people with disorders affecting their balance or sensorimotor control. Procedure: Surface EMG was used, with two electrodes on the anterior tibialis, peroneus longus, and medial head of the gastroc. Subjects were asked to provide a maximum one repetition contraction for each of the three muscles, so the EMG activity during the balancing could be compared. The subjects were allowed to practice balancing on the BOSU until they were able to balance barefoot at least 10 seconds on each side. RESULTS: An ANOVA yielded no significant difference in EMG activity of the three muscles between either side. Limitations: The use of surface EMG which can cause “cross-talk”, and the study does not look at hip or trunk EMG. Relevance: Unfortunately this study can only really be applied to 20ish year-old males with no recent lower extremity injuries (will women’s wider hips cause their muscles to react differently?). For rehab purposes this study lacks relevance, but for strength and conditioning professionals this study allows one to conclude that basically for balance training, it does not matter which side of the BOSU you train on. For future research, the hip and trunk muscles must be looked at, along with subjects of a much older age or with previous lower extrmity injuries to see how ankle vs. hip vs. stepping strategies are utilized in these subjects while using the BOSU. So, to answer my student’s question, it does not really matter which side of the BOSU you utilize for balance training, I guess that is truly why they call it the BOth Sides Up Ball. Thanks for the article review Doc! I think the bigger question is, “WHY are you on the BOSU?” Esp. if you are not an athlete doing some type of rehab. 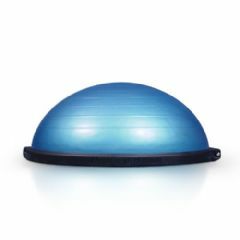 Granted, I come to your site often, but I was doing a little research on BOSU balls and came across this post from a Google search. Not sure I know how I missed it. Anyways, I’m with Mike on this one. Hi. Just wanted to let you know, I appreciate your style, yr info is a little bit different makes it stand out. Personally I am bored of seeing the same thing all of the time. I’ve just bkmrkd this page right now 🙂 Good job.